Lithuanian rabbi, cabalist, and chronicler; born about 1660; died at Minsk about 1746. He was a descendant of Solomon Luria, and traced his genealogy back through Rashi to the tanna Johanan ha-Sandlar. He was rabbi of Glusk, government of Minsk, till 1711, when he was called to the rabbinate of Minsk, where he officiated also as head of the yeshibah till his death. Heilprin was one of the most eminent Talmudists of his time. He was opposed to casuistry, and on this account succeeded in grouping around him a great number of liberal-minded pupils. For a long time he had to sustain a hard struggle with Aryeh Löb b. Asher, who, while still a young man, had founded a yeshibah at Minsk, which at first was very flourishing. Aryeh Löb attacked Heilprin's method of teaching; and the antagonism between them spread to their pupils. Later, Aryeh Löb, being obliged to assist his father in the district rabbinate, neglected his yeshibah, which was ultimately closed, and Heilprin was no longer molested. Heilprin devoted a part of his time to the study of Cabala, on which subject he wrote a work. He was opposed to giving approbations to new books, deviating, as he himself says, only twice from his general principle in this regard. The two works so favored were the "'Ir Ḥomah" of Abraham Judah Elijah and the "Magen ha-Elef" of Aryeh Löb of Plock. Heilprin is especially known through his "Seder ha-Dorot." This work consists of three independent volumes or parts. The first of these, entitled "Yemot 'Olam," is a history from the Creation down to his own time. The author always endeavors to give, by means of calculation, the dates of Biblical person-ages. He bases his work on the "Yuḥasin" of Abraham Zacuto, on the "Shalshelet ha-Ḳabbalah" of Gedaliah ibn Yaḥya, and on the "Ẓemaḥ Dawid" of David Gans. It seems that this first part was written when the author was still young; for the last event which he registered was one occurring in 1697. The second part, "Seder ha-Tanna'im weha-Amora'im," contains lists of the Tannaim and Amoraim in alphabetical order with their dates. Part III. is a kind of catalogue containing first the names of all the authors, then those of their works, both arranged in alphabetical order. Heilprin based this part on the "Sifte Yeshenim" of Shabbethai Bass, but added a great number of other titles. He states in the preface the many advantages of a knowledge of the chronological order of the Talmudists, which indeed in certain cases is absolutely necessary. The whole work is followed by notes on the Talmud, also arranged in alphabetical order. It was published for the first time by Heilprin's grandson, Judah Löb Heilprin, at Carlsruhe in 1769. There exist several other editions, the latest being the revised one of Naphtali Maskileison, Warsaw, 1882. 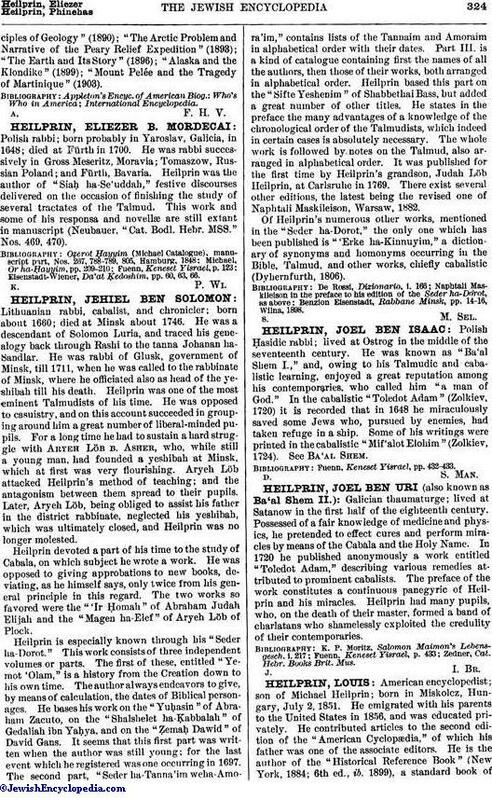 Of Heilprin's numerous other works, mentioned in the "Seder ha-Dorot," the only one which has been published is "'Erke ha-Kinnuyim," a dictionary of synonyms and homonyms occurring in the Bible, Talmud, and other works, chiefly cabalistic (Dyhernfurth, 1806). Benzion Eisenstadt, Rabbane Minsk, pp. 14-16, Wilna, 1898.